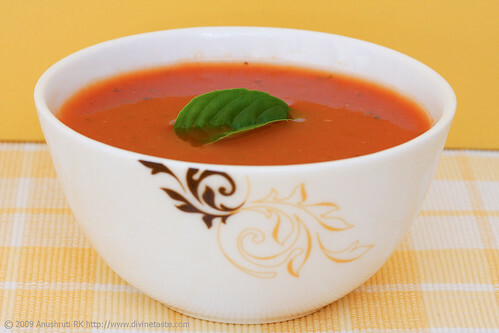 I always thought that a good tomato soup needed a certain amount of fat in it to taste right, until I made this soup. With simple but robust flavours of tomatoes, basil leaves and pepper, this soup simply stands out! And to make things lighter, there is zero amount of fat in it. 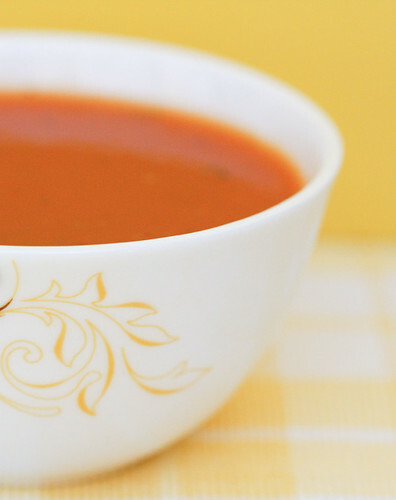 An ideal soup for weight watchers and the calorie conscious. I don’t belong to either of the above categories. This recipe happened by accident when I forgot to add my usual dose of olive oil into the bubbling pot. It was only when I tasted my first spoon that I realized my omission and by the second spoon I realized that it was a welcome one. I enjoyed this soup so much that thereafter I always made it without any fat in it and almost always served it with crash hot potatoes and oregano paneer. You could also experiment with this soup by adding other herbs like sage and tarragon. I made this once with a combination of basil, sage and tarragon with excellent results. If fresh basil is unavailable, substitute it with dried basil leaves. Although this would be a compromise on the flavour, it is quite an acceptable thing to do when fresh herbs are simply unavailable. Wash and remove the eyes of the tomatoes. Cut them into halves. Chop the carrots into bite sized pieces. 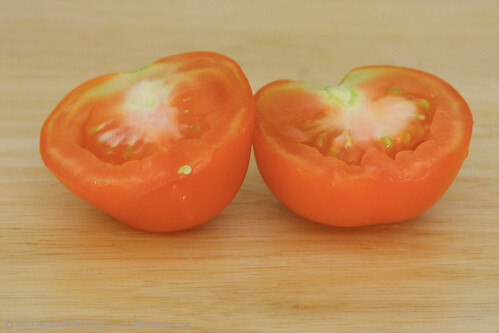 In a pressure cooker, combine the tomatoes, carrots and the water and pressure cook until 2 whistles. Alternatively use a saucepan and cook until the vegetables are done. Allow to cool and strain and reserve the cooking water. In a food processor or blender puree the vegetables until smooth and strain again to remove seeds, if any. In a saucepan, mix the reserved water with the pureed vegetables, roughly chopped basil leaves, sugar, salt and pepper and bring to a boil. Never heard of that spice before- tarragon… wonder how it smells and tastes…! Thats my all time favorite combination!! A comfort soup for me! Simi: Tarragon is widely used in French cooking. It has a strong smell and therefore should be used sparsely or else it overshadows all the other spices used in cooking. Used sparsely, it lends a delicate aromatic flavour and taste to a dish. Perfect for this rainy season!! !Yummy click!!! Delicious and Healthy recipe.. the basil you are using here is the Italian sweet basil? I m from India…i really dont know if it is available in stores where i stay..can i substitute this with Indian Holy basil leaves?? Another thing is … Is it mandatory to use brown sugar in the recipe?? U reply will be of great help..
Vatsala: That's great! Glad I could be of help when you were down!